FindsPro is an adware based on the Widdit engine. It is developed by Simply Tech LTD and it usually enters the system bundled with other applications. We do not think that users download this adware consciously because it is impossible to get it from its official website findspro.com. In fact, it does not really matter how this program has slithered onto your computer because you should still remove it as soon as possible. We will list all the reasons why it is necessary to do that in this article. On top of that, we will explain you how to eliminate FindsPro easily and quickly, so make sure that you read this article from beginning to end. Users usually find out that they have FindsPro advertising-supported application installed on the system when they surf various online shopping websites because various coupons start appearing on their screens when they read descriptions of particular items or want to buy something. Of course, users might notice commercial ads when they visit other kids of websites too. 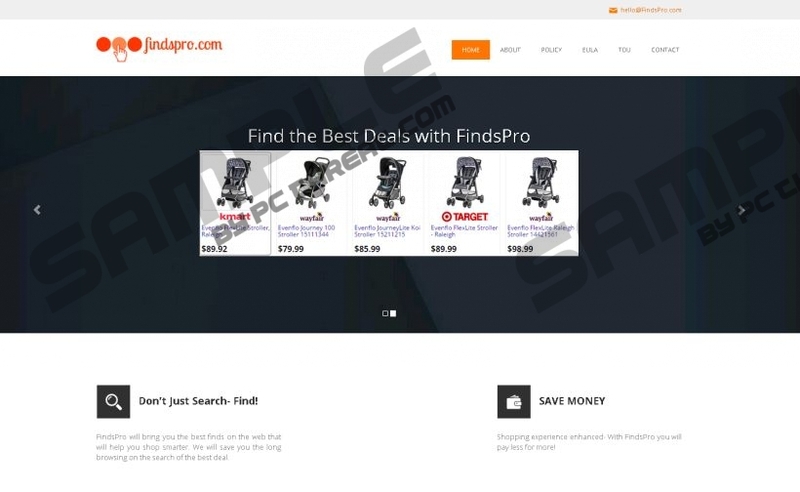 If you already see various shopping offers, pop-ups, and coupons, there is no doubt that FindsPro is installed. You have to remove this program because it is untrustworthy and its ads might even redirect you to the websites that contain malicious software. Do not let these ads fool you; yes, they look interesting and it might even seem that they can help you to save money. However, it is likely that they will expose you to threats more quickly. Specialists working at pcthreat.com have found that this program is not a typical adware program because it uses a service that can hijack the user’s homepage. This advertising-supported application can also connect to the Internet without permission and it can track you in order to find out your approximate location, the websites you visit the most, the time you spend on them, the content you access, and similar details. If you do not like how FindsPro acts and want to protect your system from harm, you should remove this adware as quickly as possible. The last paragraph is dedicated to the removal of this program. It is very likely that you will be able to remove FindsPro via Control Panel; however, the program might be updated and it might be no longer possible to erase it easily in the future. If it happens, you will be able to get rid of it automatically. In other words, you will have to scan your system with a trustworthy automatic scanner. Unfortunately, not all the tools available on the web are reliable, so we highly recommend that you acquire SpyHunter. We do not say that it is the only trustworthy tool available; however, you will be safe if you acquire and install it. Do not forget that antimalware tools have to be enabled and kept like that all the time. Find the unwanted application and then delete it from the system. Quick & tested solution for FindsPro removal.